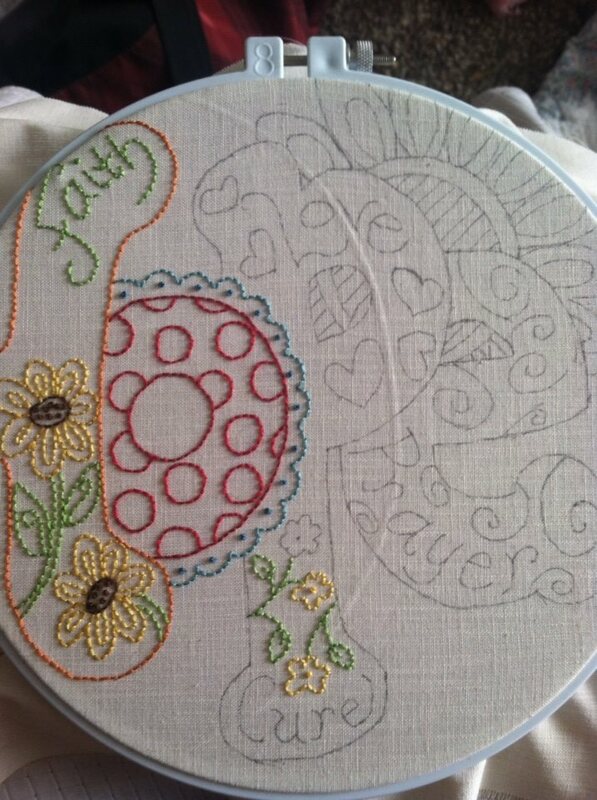 Okay stitchers, it is WIP Wednesday once again and today I am working on Words of Hope designed by “Oh My Bloomin’ Threads.” This one would have been finished yesterday but my power went out due to gale force winds and an idiot who didn’t want to trim his tree. The power company cut the tree down and fixed the transformer that blew up; however, the power was off from about 2:30 pm yesterday until 5:30 am this morning. It’s kinda hard to stitch when there is no light. I am a member of the Benevolent Protective Order of Elks (aka BPOE or Elks). During the summer and winter conventions here in Idaho, the Elks auction off items to benefit the Betty Heiss Cancer Research Foundation. I have always tried to stitch something for the last year or two for this auction. I saw this pattern and decided to stitch this up and turn it into a pillow for the summer convention in Cauldwell, Idaho. Then, my local stitch group was asked to stitch a couple of these up to help raise some money for a Relay for Life Team. Of course, we agreed and begin to stitch away. My mom has stitched six of these, one in the regular colors shown in the image above, and one in each cancer ribbon color. I have finished the one for the Betty Heiss auction. The next two will be for the Relay for Life team. I might do some bread clothes using this design but I only have until July so we will see what happens.